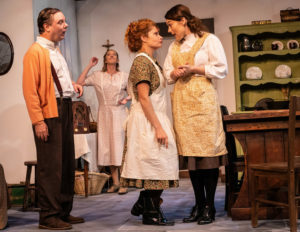 Brian Friel’s Dancing at Lughnasa is a drama about five Irish sisters – spinsters in their 20s, 30s and 40s – living together in the family home in Ballybeg, County Donegal in 1936. It won the Tony for Best Play in 1991, seven years before it became a movie, with Meryl Streep doing one of her famous chameleonic accents, faith and begorrah. The Tampa cast – the five female leads, and the three male actors in supporting roles – roam around the not-quite-finished stage, doing leg-stretch warmups and joking with each other – mostly about their Irish accents. They get in each other’s face and draw out the word “Loooonahsa” (that’s how it’s pronounced) and say things like “Oy tink yer roight” (I think you’re right). There’s a lot of laughter. It sounds like Sinead O’Connor, Bono and Maureen O’Hara from The Quiet Man are playing a spirited game of skittles. It’s the actors’ first day out of the rehearsal room and onto the stage, which is divided into halves – one side is the cozy kitchen of the Mundy sisters’ cottage, the other is the view out the kitchen window, of their garden. Director David Jenkins tells the cast to be careful, that the “grass” is not entirely glued down yet. He also warns them that, wherever they go in the garden, don’t touch the tree. Katrina Stevenson, who plays Meg, the jokester of the family, climbs onto the newly-arrived dining room table. During the show, she’ll dance a spirited jig up there, while her “sisters” clap and cheer. Stephenson tries a bit of her dance, and the table doesn’t so much as quiver. After she consults with Jenkins, the director pronounces it good to go. As they begin Act 1, the transformation is astonishing. Even though they’re dressed in their street clothes – jeans and T-shirts, mostly – the five women become the Mundy sisters, interacting and overlapping, each assuming the distinctive traits and personalities of her character. 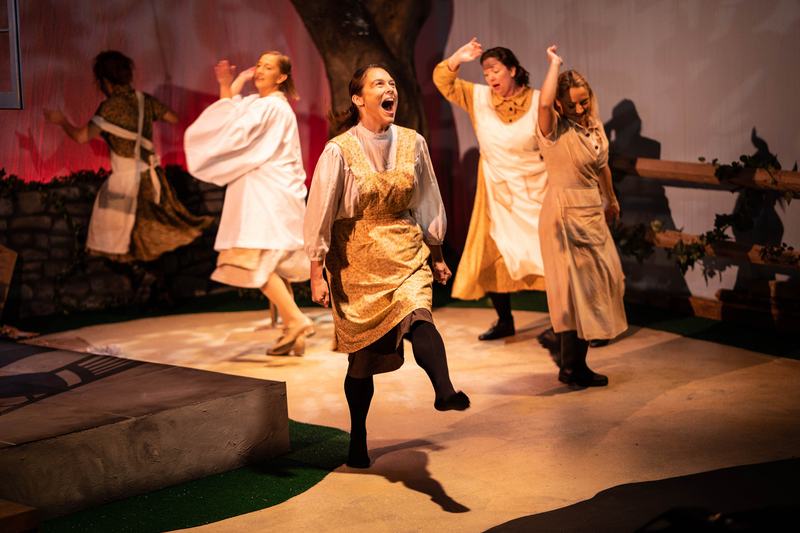 A big part of the charm of Dancing at Lughnasa is the tender way it balances heavy drama with lighthearted moments. Kind of like life itself. “This is the final layer that we as actors are kind of putting on top,” Stevenson says afterwards. “They all have a mask that they wear in front of each other, in front of the group, and especially whenever anybody from the outside comes in. Even stern and judgmental Kate, the eldest, is looking forward to turning a spirited jig at Lughnasa as a respite from her hardscrabble days. Chris, the youngest sister, is raising a young son born out of wedlock. Michael, who lives in the house with his mum, only appears as an adult, narrating the play from the sidelines. “A lot of the conflicts the sisters have are not external, they’re internal,” says Emily Belvo, who plays Chris. “Every single one of us has an internal problem that’s down in our core – and the way this show is written, if you take one person out, it’s not the same story. We need each other, we really feed off of one another. We react to one another. According to director Jenkins, “textual analysis” – i.e. looking at a play on paper – is only a small part of the adventure for cast and crew. “Everything changes once you start to get it up on its feet, and you put it in real humans’ mouths and bodies,” he explains. “The relationships and the stories that are on paper really are two-dimensional until that point. Then you get these five unique women telling these stories, using those characters, and things start shaking out that are probably unique to each production. Unpacking a lot of that has been pretty interesting. Dancing at Lughnasa opens Friday, June 15 (preview performances June 13 and 14). Information and tickets here.